The term commissioning comes from shipbuilding. A commissioned ship is one deemed ready for service. Before being awarded this title, however, a ship must pass several milestones. Equipment is installed and tested, problems are identified and corrected, and the prospective crew is extensively trained. A commissioned ship is one whose materials, systems, and staff have successfully completed a thorough quality assurance process. 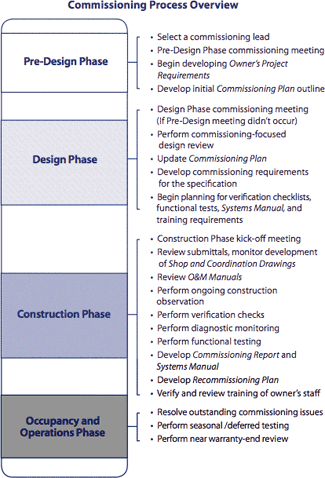 Building commissioning takes the same approach to new buildings. When a building is initially commissioned it undergoes an intensive quality assurance process that begins during design and continues through construction, occupancy, and operations. Commissioning ensures that the new building operates initially as the owner intended and that building staff are prepared to operate and maintain its systems and equipment. Retrocommissioning is the application of the commissioning process to existing buildings. 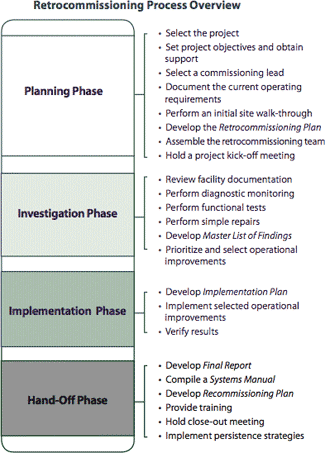 Retrocommissioning is a process that seeks to improve how building equipment and systems function together. Depending on the age of the building, retrocommissioning can often resolve problems that occurred during design or construction, or address problems that have developed throughout the building's life. In all, retrocommissioning improves a building's operations and maintenance (O&M) procedures to enhance overall building performance. Recommissioning is another type of commissioning that occurs when a building that has already been commissioned undergoes another commissioning process. The decision to recommission may be triggered by a change in building use or ownership, the onset of operational problems, or some other need. Ideally, a plan for recommissioning is established as part of a new building's original commissioning process or an existing building's retrocommissioning process. * Haasl, T., and K. Heinemeier. 2006. "California Commissioning Guide: New Buildings" and "California Commissioning Guide: Existing Buildings". California Commissioning Collaborative.